Lorraine Paton: Woo hoo! Reviews for Devin's Second Chance! Woo hoo! 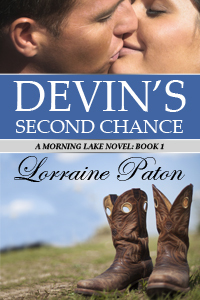 Reviews for Devin's Second Chance! Devin's Second Chance has been available for just over two months and reviews are starting to pop up all over the place! What are people saying about Devin's Second Chance? Blurb: Cowboy Devin Trent can't believe his matchmaking mom is trying to set him up with Claire Best, the photographer at the local art gallery. She should know better than anyone why he doesn't deserve a second chance at love. What surprises him even more is that he is drawn to Claire and she seems interested in him, too. Their mutual attraction grows every time they see one another, but when he suspects Claire is keeping a secret he becomes wary. After all, his first marriage was ruined by secrets and lies. Can Devin earn Claire's trust? Or, will Claire's secret end their relationship before it begins? Thank you to everyone who has taken a chance on reading a debut book by an unknown author! This has been an amazing experience for me so far, and I'm excited to be releasing my second book, Annie's Christmas Plan, soon! Mae Clair - What to Read Thursday! Judith Duncan - What to Read Thursday!